Back on 21 February I reported the sudden arrival of a black pheasant in the garden. We are now having three black pheasants regularly visit: two males and one female. As they are getting more used to us, they are spending increasing time wandering around the garden, and though they are wary of us, they don’t become very agitated as long as we approach them slowly, they just strut off in the opposite direction. The female is noticeably smaller and plainer than the males, who are both very handsome and don’t seem to be bothered by one another, which surprises me. All three of them seem to becoming noticeably plumper, probably due the amount of wheat they are packing away! They don’t seem to be causing any problems except for the one which got inside the greenhouse the other day and became very agitated when I appeared, though he didn’t actually harm any plants, just one of the plant covers I was using. Left: you can see all three pheasants in this shot – the female is the one closest, on the left. Right: close up of one of the males. We have also had two bird species in the garden which I haven’t seen so near the house before. The first was a crow, which would really have drawn my attention prior to the advent of the pheasants, but I’ve got used to seeing bigger birds now so it took a few moments for it to dawn on me that it was neither a pheasant nor a jackdaw, the latter being regualar visitors. Within a few minutes we then had a magpie arrive. I’ve always thought it strange that we don’t see magpies much here – sometimes in the trees at the far end, but this if the first I’ve seen come close – he was quite nervous, so it will be interesting to see if he returns. The friendly blackbird continues to demand we dig bits of the garden so he can find worms, and there is a definite tweeting when he goes back to the nest with a beakful. Hopefully we’ll see fledglings soon – as long as the magpie doesn’t find them first. The only butterfly interest was two Peacocks, flying together and sitting for a time on the bare earth of one of the vegetable beds, soaking up the sun. There were several types of bee buzzing around. I only got a good look at one, which was buzzing angrily behind the bubble-wrap in the greenhouse, which – when rescued – looked like a small bumble bee and was all black. Looking it up, I think it was a female Hairy-Footed Flower Bee (what a lovely name!) and as they like red dead nettle and lungwort, both of which I have in the garden, this makes it all the more likely. Plant the right plants and the wildlife will come. Saturday was a gorgeous day here – lots of sunshine. That, predictably, brought out the wildlife. I was lucky to catch the two Small Tortoiseshells – I’d come back from the far end of the garden to get something, got delayed, and these two flew in and settled on the bare earth of the being-replanted herb bed long enough for me to take the photo, then flew off again. The beetle is one I see increasingly in the garden, though I’m not sure of its exact identification – I guess its a ground beetle; the body is about an inch long (2cm +) and the antennae are like dark blue beads strung on wire. Do tell me if you know what it is. We are now pretty sure that we have a pair of blackbirds nesting in our juniper bush/tree – it’s about 15′ (3m) high. The male is very friendly: whenever we are gardening near the house we find him watching us to see if we’re going to do something useful, like dig up some worms, so he can take them back to the nest. Interestingly, he doesn’t follow us to the other end of the garden when we are working on the vegetable beds, possibly because there are one or two other pairs regularly seen up there, so that is their territory. We have now seen both him and his “wife” using the pond to bathe: we had a pebble ramp put in one end when it was built, and the loose pebbles have been a total pain, we’ve taken most of them out now, but a few big ones were cemented to the liner, so they give a good point where a bird can get just deep enough to have a bath (apologies for the poor photos – I was using a zoom lens so I didn’t disturb him, and I think this is camera shake). The pond is now thirteen years old, and this is the first time I’ve actually seen a bird bathe in it – only goes to show, you just need to keep watching…. I’ve been avidly scanning the skies for the last few days, looking for swallows, as I’ve been seeing the Portland Bird Observatory reporting them in some numbers for the last few days. Today, I had several sightings, and some hearings, too (if that’s a word – it ought to be): I love the sound swallows make, I call it their “twiddly” noise, and it’s the sound of summer to me – I always feel so folorn when it stops in September. We spent the afternoon continuing to work on the pond surround, with the help of a blackbird and a Peacock butterfly. Left: blackbird and worm. Right: Peacock butterfly sunning itself. The blackbird seems to have just realised he can eat worms that need more than one bite: before today he’s limited himself to very small ones, but suddenly, he’s tackling some quite big ones. He doesn’t appear to be flying off with them, he seems to be eating them all, and with the amount he’s finding thanks to our digging, he should be a very fat blackbird soon. The butterfly appeared for a short time, and sat on one of the stones we were using for a few minutes, soaking up what sun there was. It’s worth remembering this is a need butterflies have – a sun-warmed surface: even if you can’t supply flowers all the time, stone, pebbles or wood can all be used as a place to soak up the heat they need to be able to fly. I managed to hobble as far as the bench by the pond today – my ankle is getting better (though it’s a shade of purple not far off yesterday’s crocus) and it was so good to get outside. Willow, the cat, joined us and sat right on the edge of a wobbly edging stone and didn’t seem to realise that she was in imminent danger of tipping into the water, which she would have hated, not just because she had got wet, but because it would have been so undignified, especially with an audience. Chris decided to move the stone to render it less unstable, stood it up on edge, and underneath it was a very small toad – we regularly see frogs, but the only toads have been baby ones and up the far end of the garden, so it was great to see one enjoying the water facilities provided. There were also a couple of newts swimming around, and the first backswimmer of the year. The other wildlife sighting of the day was a female blackbird gathering nesting material. She was particularly intent on pulling up last year’s lanky stems from some perennial viola cornuta – she was gripping a stem in her beak, then bouncing backwards to separate it from the main plant. 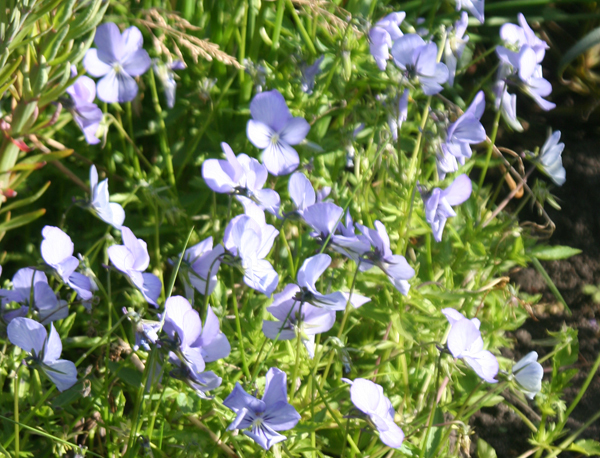 This is an example of the books telling you one thing – they say give your violas a haircut at the end of the season – but the wildlife preferring you not to be so tidy. Viola cornuta is a particular type of viola which is truly perennial, and tends to ramble gently, rather than being a clump. The one in the photo is either ‘Broughton Blue’ or ‘Icy but Spicy’ – I’ve taken cuttings off both and lost track of which is which: they aren’t very different. I’ll do a full post on them sometime, but one of the best plant nurseries I’ve found for a good range of viola cornuta is www.elizabethmacgregornursery.co.uk . They are in Scotland, so I purchased by mail order, and they arrived beautifully packed and in really good condition. I have to admit violas aren’t very good for wildlife, but they are wonderful “doers”, blooming for months on end and needing virtually no attention – especially if the blackbirds do it for you.